What Are Different Leather Grades in Furniture? The quality of leather furniture, bags and clothes varies depending on the animal from which it comes, the kind of dye used and the amount of processing the leather undergoes before it becomes a finished product. The industry terms for leather are "full grain" and "top grain," which can be confusing, but if you know the definitions and what to look for, you can assess the quality of a leather product before purchasing it. Like wood, leather is rated by the natural grain patterns on animal hides. Determine what kind of animal hide the leather is made of. The strongest and most common is cow hide, which is so thick that it's split into two layers, with the top layer considered the best. You can identify cow hide because the grain is uniform and closely packed together. Buffalo hide is similar, but less expensive. Sheep hide is weaker than cow or buffalo and you can determine the grain pattern because it's less uniform and more widely spread out. Goat hide is used to make suede products and has a pattern of three large grains with smaller grains surrounding them. Pig hide has fewer grains but larger pores and is also used for producing suede. Feel the leather to determine if it's full grain, full top grain, or top grain. Full grain is the strongest leather and is made from the outermost layer of cow hide. The natural grain and imperfections are left alone so it should feel soft and supple, but it's really the most durable leather available. Top grain leather is also made from the outermost layer of cow hide, but the natural grain and imperfections are sanded away in the tanning process and imitation grains are stamped on it. Top grain leather should feel thicker and more like plastic, but it's also durable and cheaper than full grain. Determine the kind of dye used in the tanning process. The finest, most durable and most expensive leather is dyed using aniline, a transparent dye that preserves the natural grain and imperfections while maintaining the leather's durability. Full aniline leather is dyed the same way, but a light protective finish is applied. 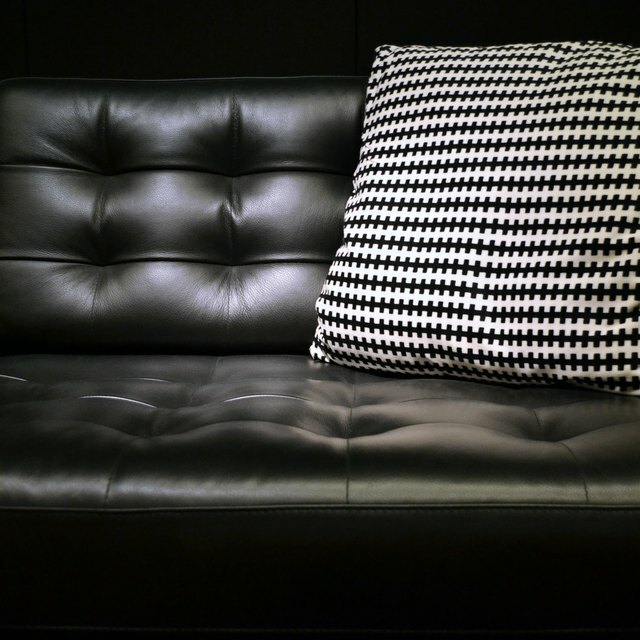 Semi-aniline leather is sprayed with color pigments to even out the color and hide imperfections. Find out how the leather was processed, which should be on the tag. Anything claiming to be "Genuine Leather" is the cheapest and least durable of all leather. Split-grain leather is made out of the innermost layer of hide and contains no unique grain or markings. Bonded leather is made from pieces of the innermost layer glued together around a cardboard base. You find bonded leather most often in belts, wallets and purses. Though it's not as reliable as the look and feel, quality leather should smell good, not like plastic or vinyl. Beware of leather products if the seller won't give you any details about where they came from. Furniture and clothing retailers should be able to tell you exactly what kind of leather you're buying. What Material Is Used to Stuff a Couch?